Seek that which unites. Overcome that which divides. The Archbishop of Canterbury, the Right Reverend Justin Welby led a retreat with Pope Francis in Casa Santa Marta this week (10-11 March) for the political leaders of South Sudan. The Reverend John Chalmers, former Moderator of the Church of Scotland was also in attendance. The ecumenical retreat was the fruit of an unprecedented collaborative effort by Lambeth Palace and the Secretariat of State. 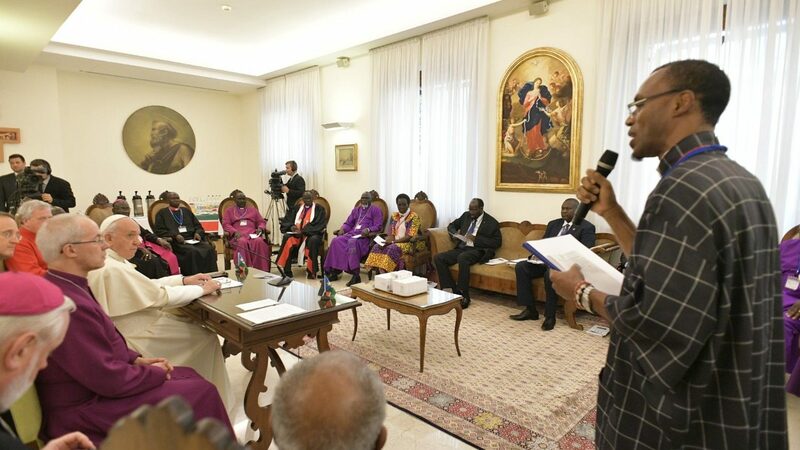 In October 2015 Anglican, Presbyterian and Catholic Church leaders from South Sudan met with Pope Francis in the Vatican. Recalling the occasion when he met with Archbishop Welby the following year, Pope Francis reported that they had asked him to visit the country, “but don’t come alone, come with Justin Welby, the Archbishop of Canterbury”. Although the ongoing Civil War, thought to have claimed the lives of 400,000 and driven 4.4 million from their homes, has thus far prevented such a visit, Lambeth Palace and the Holy See have continued to be in close contact about how to promote peace and bring an end to the conflict. A new peace agreement that would see government and rebel forces united within a national army, and a power-sharing government under President Kirr and five vice-presidents, is due to come into effect next month on 12th May. Archbishop Welby therefore proposed to host an ecumenical retreat for the President and vice-presidents in Casa Santa Marta, and the proposal was accepted by Pope Francis. In attendance were Mr. Salva Kiir Mayardit, President of the Republic, as well as four of the five designated Vice Presidents: Mr. Riek Machar Teny Dhurgon, Mr. James Wani Igga, Mr. Taban Deng Gai and Ms. Rebecca Nyandeng De Mabior. Although the retreat was hosted by Pope Francis and Archbishop Welby, African Church leaders were present, both from South Sudan and beyond, and the Reverend Father Agbonkhianmeghe Orobator, S.J., President of the Conference of Major Superiors of Africa and Madagascar, preached the retreat conferences.